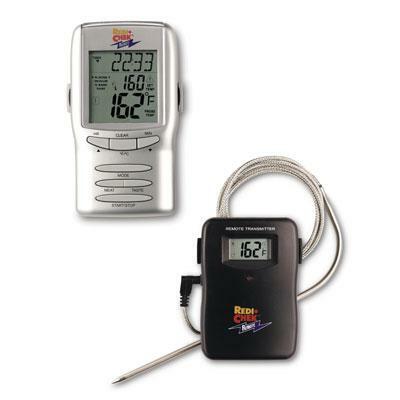 Maverick Redi-Chek Deluxe Single Probe Digital Thermometer with Taste settings. Display features: Meats (choose from six: beef turkey pork veal lamb or chicken); Taste or doneness (rare medium medium well well done) as appropriate for each meat or choose your own target; Set temperature up to 410 degrees F (210 C) and in your choice of F or C; Actual internal Food temperature; Elapsed cooking timer (alternates digits with meat by pressing the MODE button). Transmitter features a display of actual internal food temperature and a red LED indicating transmissions (which occur whenever temperature changes by degree). The probe is stainless steel with flexible braid stainless steel sheathed connecting wire 40" overall length. Transmitter measures 3-1/2" x 2-3/8" x 3/4" weighs 2.8 oz. and includes 2 AA batteries. The signal is sent on 433.92 MHz. The receiver measures 4-3/8" x 2-3/8" x 1" weighs 3.7 oz. and includes 2 AA batteries. This item cannot be shipped to APO/FPO addresses. Please accept our apologies.